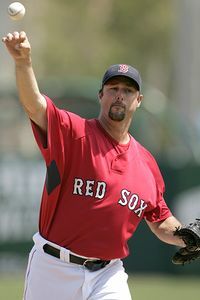 When I heard Tim Wakefield was getting the start today vs Felix Hernandez, I figured the bookies would either keep the game off the board, or make the defending Cy Young Winner -1500. Surprisingly, King Felix is just -120 over the knuckleballer. Knowing who my 17 readers are, I think our fathers are about the same age as Wake and probably in better shape. So if your dad was pitching against a 25 year old stud and there was a bet of who would pitch more innings what would you wager. Your wife? First born? Your house/condo ? Wife’s wedding band? Your home? Your left testicle? Your right arm (or left if you are Big Mick)? Eye sight? Your life savings? Well how about a couple hundred bucks for starters. Today if you are looking to make some free money and to start the month of May off on the right foot, bet the Seattle Mariners -120 over the Boston Red Sox or if you have the prop bet King Felix -150 to pitch more innings than Tim Wakefield.